In Acts 20:35, Paul cites Jesus when he writes, “It is more blessed to give than to receive.” Yet here’s some interesting trivia for you: We don’t have a record of Jesus saying that in any of the four Gospels. Not verbatim, anyway. What a great reminder that Jesus said tons more than we have recorded! Let’s be honest, we all love getting something new. It’s fun! Just watch a kid on Christmas – or an adult, for that matter. But Jesus isn’t denying us our fun in His Sermon on the Mount. He’s warning against the temptation to accumulate material wealth here on earth. Getting is temporal. It’s here and gone. We can’t take it with us when we die. But giving? Giving is eternal. It can’t be stolen. It never fades, rusts, or decays. And – to top it all off – giving has an unintended blessing. Your heart will be found in the place where you spend your money. Bought a new boat? Guess where you’ll be every weekend. New house? You’ll spend most Saturdays working on the honey-do list. While you work, you’ll be sporting that alumni T-shirt you love because so much of your money went there 30 years ago. Deciding you need to relocate your treasure is the easiest move you might ever make. It’s choosing to give rather than get. Because where your treasure goes, your heart follows. Said differently: The act of giving to the things that are on God’s heart increases your intimacy with Him. He gets more of you. You experience more of Him. That’s priceless. Jesus, it’s pure grace that I can receive more of You by surrendering more of me. It seems like an unfair exchange – one totally in my favor. I accept! Show me where to give today, where to spend my heart and resources, so I might be closer to Your heart. Amen. Get a Glimpse of Your Heavenly Future! The Bible says that those who've trusted Christ will also stand before Him for a personal conversation about their lives at an event called the Bema. 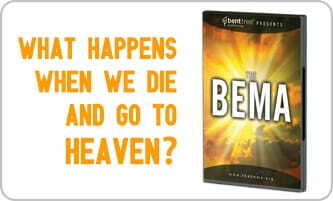 We want to give you a glimpse of what that day might look like and help you prepare for it by sending you a DVD copy of Pete Briscoe’s dramatic presentation, The Bema. Request your copy!